Jadran is more than a 3 stars hotel in Jesolo: what we offer to our guests is a place where they can relax, enjoying whatever they need and want. In other words, what we offer is “choice”: many believe that Jesolo means just beach and sun bathing but, actually, there is a lot more. The seaside is the biggest attraction, of course, but also nature, amusements and food can be enjoyed, along with good wine and, why not, shopping. And speaking of “choice”, why should you choose Jadran as your 3 stars hotel in Jesolo? For over 20 years, the same family run it, making each room, each table, each corner a cosy place where everybody can relax enjoying a faultless service and, above all, a warm and smiling staff. Our strength includes but it is not limited to courtesy and good humour. For instance, a hotel with a swimming pool in Jesolo means, again, having different options: tiredness, kids, heat wave… for many different reasons, our guests may, sometimes, prefer the relaxing atmosphere of our environments to the beaches. And among the services we guarantee, the swimming pool is essential. Our rooms are bright and air-conditioned, and all have a balcony. Beach umbrella, sunbeds, cleaning and services included in the price! Dive in a moment of fresh relaxation, and enjoy our bar service! Special Deals for our Hotel in Jesolo: book now on our Official Website and find the best online price! Not only a hotel with a swimming pool in Jesolo, we are located in a great, strategic location: only 100mt from the fabulous Jesolo beach and 50mt from the famous evening pedestrian zones with stores, cafes, bars and game halls, such as Piazza Torino and via Altinate. 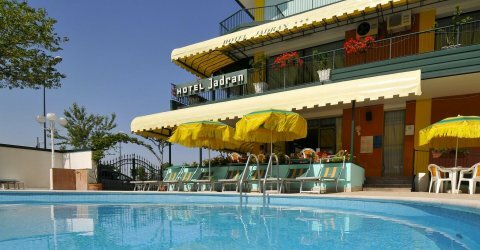 The Hotel Jadran has run from the same family for over 20 years, and means cortesy and cheerfulness. It is situated in a great location only 100 m. from the fabulous Jesolo beach and 50mt from the evening pedestrian zone with stores, cafes, bars and game halls. The Hotel Jadran offers everything you need for unforgettable holydays. We offer to our guests a free Internet access with Wi-Fi technology. You can, after asking the pasword at the front desk, surf the Internet from any room with your PC, laptop or PDA.